Mountainair, New Mexico. Small town with a population of approximately 1200. This picture is of, what we called as kids, “The Farm”. 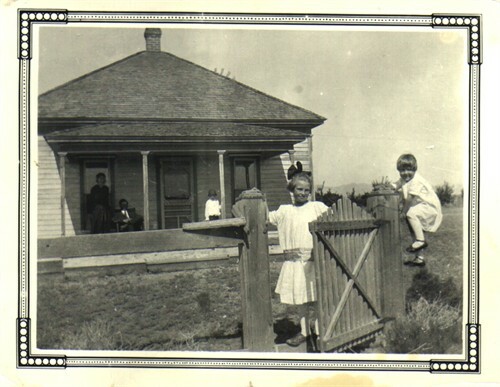 That is my grandmother, Rae, on my maternal side at the gate along with her sister Nadine on the fence. On the porch, her mother, Besse, her father, Ralph, and her brother, Nolan. Below is a portion of a transcript written by my maternal grandmother, Letha Rae Stewart Stephens on her memories of life in Mountainair, New Mexico. “…As the second December (1908) rolled around I arrived in a tent during a snow storm of such depth that Dr. Black had difficultly negotiating the trip on horseback to attend the event. Next summer a two-room house was built. One room was papered with blue building paper, the other with newspapers and pages of catalogues glued with flour paste. Our needs were procured from W.R. Orme Grocery, Howard Griffin Drugs and Dunlavy Mercantile. We hauled our water from the Ranger Station wells. Under the supervision of Mr. Carscallan, Forest Ranger, my father helped plant pine trees on burned over land in the Manzano mountains, also survey part of southwestern Torrance County. Steam engines on the newly constructed railroad often lost chunks of coal as they sped around curves; several families augmented their weekly fuel by retrieving this coal. On such a trip I recall how we were just ready to start home when one horse broke loose and took off, leaving us only one horse to pull a wagon of coal, a difficult six-mile trip. This house is no longer there…but my Uncle now owns the land and has built his own place on it. It’s nice to know that it will continue to be in the family for many more generations. Isn’t it wonderful to have something written by our grandmothers! I can just hear the admonishments to “not get dirty” looking at those little dresses!